Gamers will be able to conquer Batman: Arkham City in 8 hours, but only if they follow the way of the ninja. Being a ninja must be awesome. I mean sure, you need to go through years of rigorous training and live in paranoia for the rest of your life, but think of all the cool powers you get! Depending on the medium, you can change between five bodies at will, make men question the futility of life, have ultimate duels set to Aerosmith's "Dream On," activate your Knife Eye Attack, and I'm sure that those kids in Naruto have something worth-while that they can do. Maybe not. According to Rocksteady Studios, another thing that ninjas can do is conquer the upcoming Batman: Arkham City in eight hours. "It's very difficult to put a number on [the campaign's length]," Rocksteady marketing game manager Dax Ginn told CVG. "I can tell you that our QA guys, who are ninjas and obviously know everything in the game, can do just the core story missions, nothing else, in about eight hours, just straight-lining." "And they know exactly where to go what to do - the most efficient way of doing it. So, someone who has no idea what to do and wants to complete everything it's going to be significantly more than that." Given how Arkham Asylum - as a proper Metroidvania-style game - had a ton of little sidequests to accomplish and plenty of exploring to be done, one can only expect that number to rise from here on out. 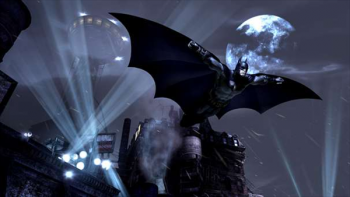 Arkham City is out this October. Better polish up your ninjitsu.